We are now hiring teens for the 2019 season! You must be between 15 and 18 years old to apply. 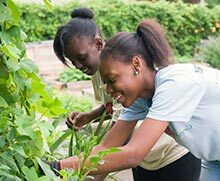 This thriving youth development program each year educates and employs 80 to 90 teens from low-income communities at three farm sites in Chicago and one in Lake County. 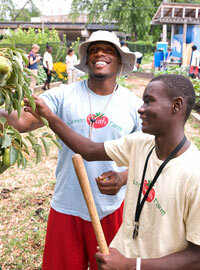 As they advance through this program, grounded in sustainable urban agriculture and Social Emotional Learning (SEL) principles, Youth Farm students learn to grow food responsibly, work as a team, advocate for food justice, eat in a healthy way, and become accountable—to themselves, their fellow farmers, and to their employers. Through nutrition demonstrations and redemption of federal nutrition assistance coupons at markets and Women, Infants, and Children offices, Youth Farm students serve their communities and gain a better understanding of pressing social and economic issues. Participants also stay in school and pursue careers—93 percent of senior participants graduated from high school in 2013, 53 percent are enrolled in college, 20 percent are working full-time, and two are in job training programs. In 2014, a Youth Farm student in her third year at the Lake County site was named a Gates Millennium Scholar. Several Youth Farm graduates have found jobs within Chicago’s growing urban agriculture and local food sector or as growers and interns within the program itself, motivated by the knowledge that they can contribute to their communities in meaningful ways. Youth Farm teens work in all aspects of sustainable farming and food systems—from planting a farm to managing a beehive, from cooking with the food they grow to selling it at local farm stands and markets, and through sales to the Garden View Café, where the chef incorporates fresh organic produce into menu items available to Chicago Botanic Garden visitors. Teens are paid a stipend for four hours per week in the spring and fall, and 20 hours per week in the summer, but the benefits far outweigh the wages they earn. By the end of the season, they have gained valuable job and teamwork skills, discovered a whole new way to look at the food they eat, and grown their support system to include supervisors, program coordinators, legislators, and their fellow participants. Been recognized as a national best practices youth development program by the Institute for Museum and Library Services (IMLS) and by the Pathways Project, an initiative of the Family Resiliency Center at the University of Illinois, Urbana-Champaign. For information, contact Eliza Fournier, Urban Youth Programs director, at efournier@chicagobotanic.org, or (847) 835-8352.